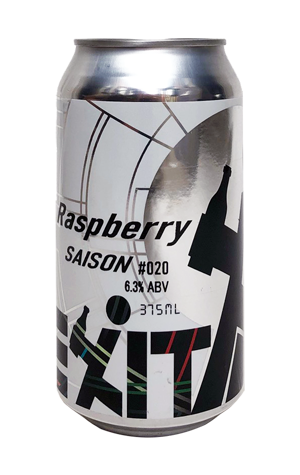 The limited release tinnies are coming thick and fast from Exit at the start of 2019, with the hazy HIPA Juice joined by a spin on their Saison within just a couple of weeks. The spin comes in the addition of pureed raspberries, with the base recipe otherwise unchanged. If you're familiar with Exit's Saison (and, for that matter, pureed raspberries), the beer has turned out just as you might imagine. There's a layer of juicy berry sweetness throughout, one that's more thinly-spread-with-a-knife than dolloped-on-with-a-spoon, adding something extra without overpowering. If anything, the puree replaces some of the fruitiness and sweetness in the original Saison with the raspberries, while leaving the other pieces – hints of straw, the drying, slightly peppery underbelly – in place. Evolution not revolution. NB If you're reading this in time, you can join the Exit crew at Uitgang on February 22 as they launch it on tap alongside kegs of Wildflower Solera and Dollar Bill Peaches plus a "secret international" keg at 4pm.